Range of standard components – Interchangeable components within each beam system for maximum versatility. One beam system can be configured to allow you to complete virtually any lift operation. Ease of storage – A sectional beam system can be taken apart for storage in a relatively small space compared to a fixed length system. Exceptional design – Our design has produced a product that is functional, easy to use and above all safe. All end components over 25Kg have lift points built in to allow for easier handling. End units sit on the ground horizontally to assist with assembly. 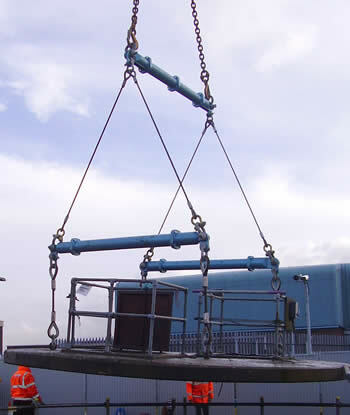 Some examples of equipment that can be lifted using SectionLift spreader beams. This list is not exhaustive and just provides an idea of the range and capability of the system.